When I was little my mom would make chicken and dumplings all the time during the winter months. I loved it!!! It’s such a comforting food. Recently I have played around with the recipe and added my own touches to it. 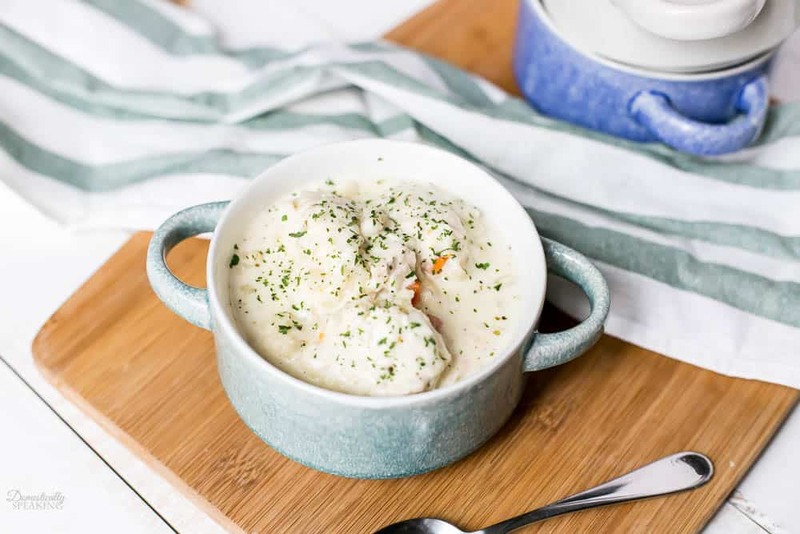 This chicken and dumplings from scratch have potatoes in them, making for a very hearty soup. If you’re looking for other comfort foods you want to try my Creamy Potato Cheese Soup and my Rustic Chicken Pot Pie with Puff Pastry. 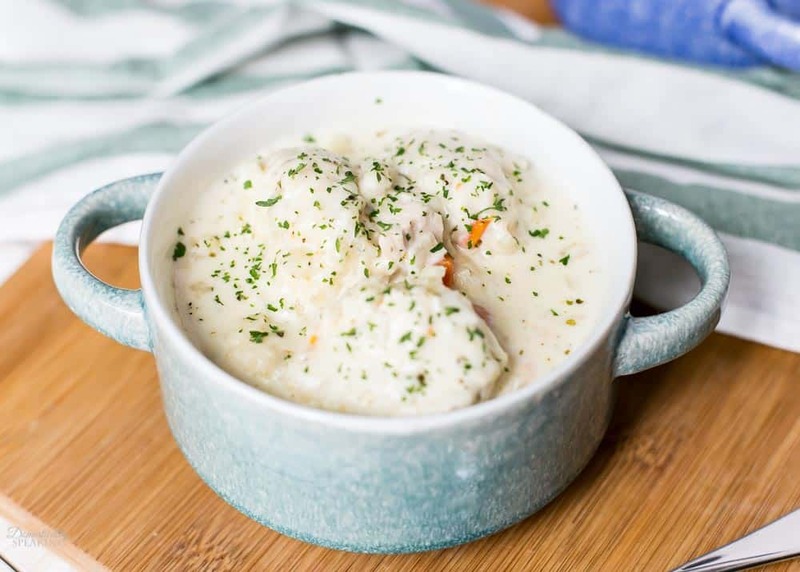 Chicken and dumplings is basically a cream chicken soup where you cook the biscuit-like dough in the soup, so they are super fluffy and delicious! 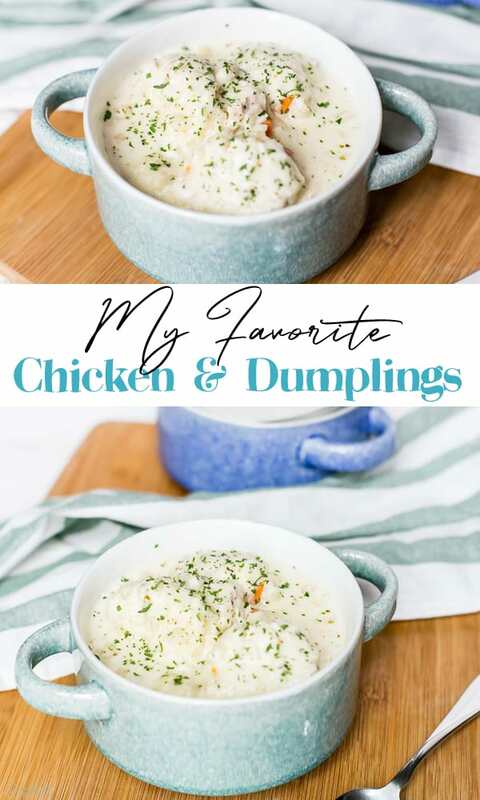 Chicken and Dumplings is definitely one of my favorite comfort foods. I like to get all my ingredients ready before starting the soup part of my chicken and dumplings. 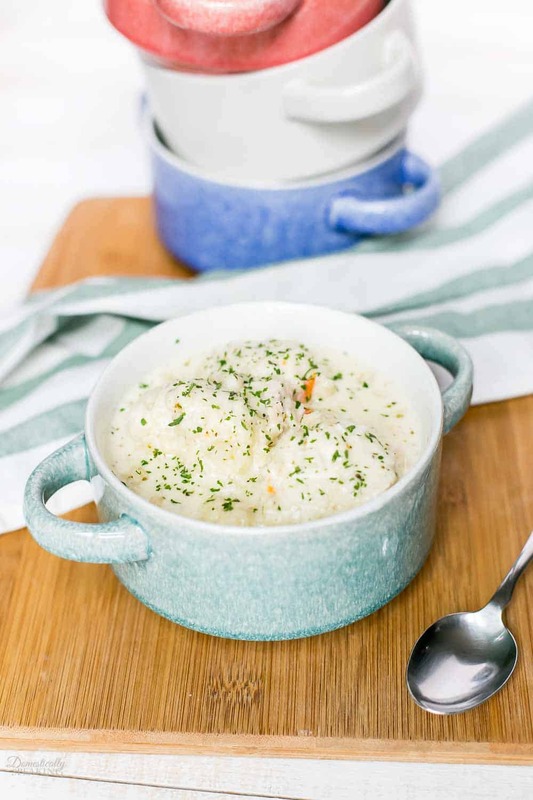 You can modify chicken and dumplings with things you love too. For instance, mine has onions, garlic, carrots, and potatoes. You could use shallots, sweet potatoes, and peas. Once you understand the base of chicken and dumplings, you can switch up with veggies you love. I modified mine slightly. Typically it’s onions, carrots, and celery in a chicken and dumpling recipe. So you start with melting butter and then adding your veggies to a stock pot. Veggies that take a little longer to soften, like carrots and potatoes, you’ll add into the pot first and let them cook a little longer. Then I add the garlic and let it bloom. Then you’ll add flour to start the thickening process. I use heavy cream and chicken stock for my liquid. You let the soup start to simmer and add your chicken and seasonings and let it simmer on low while you prep the dumplings. If you’ve never made dumplings, don’t worry – they are super easy! It’s like making a drop biscuit dough. You probably have everything you need already. So let’s get on to this delicious recipe! 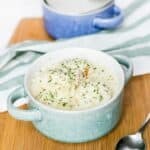 My Favorite Chicken and Dumplings recipe. The dumplings are so fluffy with herbs and the soup is made with potatoes... so good! Melt the butter in a large pot. Once the butter has melted, add the onions, carrots, and potatoes. Let them cook over medium heat for about 5 minutes. Stir every 30 seconds or so. Once the veggies have started to soften, add the minced garlic. Stir in and allow the garlic to cook about 1 minute. Sprinkle the flour on top of the veggies in the pot. Stir the flour in and stir continually for a couple of minutes. Add the heavy cream and chicken stock to the pot. Stir to combine. Stir frequently. Once it comes to a boil, add the cooked chicken and seasonings. Stir in. Reduce the heat to low and let it simmer while you make the dumplings. Stir every couple minutes. In a bowl add the flour, baking powder, pepper, salt, and Italian seasonings. Mix together. Make a well in the center of the bowl. Add the whole milk and melted butter. Gently combine. The dough should be damp. If it's dry, add another teaspoon of milk and stir again. Repeat until the dough is just damp. I use a basic spoon (teaspoon size) to drop the dumplings into the pot. I start by placing the dropped dumplings around the outer edge of the pot and work my way in. Try to not overlap the dumplings. Once all the dumpling dough is in the pot, cover the pot with a lid and let it simmer on low for 15 -20 minutes. Serve hot! You can also refrigerate the leftovers. Don’t those dumplings look so fluffy? I think these herb dumplings really make this homemade dish. It’s so full of flavor in every bite. This looks so delicious. I will definitely try it. I hope my dumplings come out as good as yours look!